<!-Eric Gill. 1882-1940--> Eric Gill. Drawing. Ex libris John Vernon. Ex libris John Vernon. Front: Design and Greek lettering. 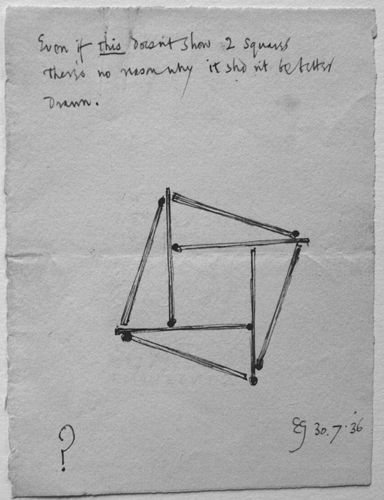 Verso: Even if this doesn't show 2 squares there's no reason why it shouldn't be better drawn." Monogrammed and dated 30.7.36. Two-sided drawing. Pencil recto and ink verso. 1936. 2 1/8 x 1 1/2. $2,250. John Vernon Lord, born in 1939, taught at the Brighton School of Art, and worked as an illustrator. 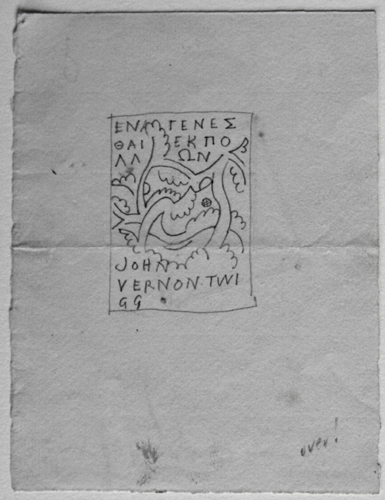 An expert in the works of Edward Lear, John Vernon Lord draws and writes poetry in a similiar vein.